What is the best solution for herniated discs? Do you suffer from back pain? Have you been told you have a herniated disc? Are you wondering what is the best solution for herniated discs? Disc disease is incredibly common, but fortunately technology is evolving and treatment is more effective and less invasive than ever before. Spinal discs have a crucial role in the spine. These discs form the connective tissue between the bones (vertebrae) in the spine. They allow the vertebrae to move, hold them together, and absorb impact. A herniated disc occurs when damage on the outer part of the disc causes the inner portion to herniate, or protrude, affecting the surrounding spinal nerves and causing pain in the back, arms, or legs depending on the level of herniation. In some cases herniation does not cause symptoms. There are many treatment options for herniated discs – surgical intervention is not necessary in most cases. The best solution for herniated discs is one that takes into account your particular condition. In many cases, minimally invasive treatment is an option if you are able to see an interventional pain medicine doctor. These specially-trained doctors are capable of eliminating pain with a minor procedure. There is often no obvious cause of disc herniation. Most commonly, some form of stress on the discs from lifting heavy loads or twisting the spine is at fault. Other common causes include spine injury and age-related issues. Over time, your discs degenerate and become rigid and less efficient in bearing your weight. Wear and tear of the spinal discs can cause disc herniation as a result of either aging or a sedentary lifestyle. Placing stress on the spine repetitively increases the risk of disc herniation and back issues in general. Exercising too rigorously or doing physically demanding work for extended periods of time can cause disc disease. Make sure that you have a regular workout schedule with an adequate stretching routine to minimize the risks involved with engaging in intense physical activity. When lifting heavy objects, pay attention to the parts of the body involved and perform the work with the legs primarily instead of the back. Excess weight increases the risk of herniation as it adds to the stress placed on the spinal discs. Maintaining a healthy weight will reduce your risk of spinal damage and improve your overall health. A sedentary lifestyle contributes to wear and tear of the spine which in turn increases the chances of disc herniation. If you spend significant amounts of time seated, pay attention to your posture, keeping your back straight for as long as possible. This ensures that you’re not adding any unnecessary pressure to the spine and discs. Smoking increases the risk of spinal disc damage as it hardens the arteries, decreases bone density, and slows down healing. Genetic factors can also play a role in increasing your predisposition to disc herniation. Pain and numbness are often the first symptoms of disc herniation. If nerves along the spine are affected, you might experience pain anywhere in the body where the nerve reaches. This may include the back, neck, buttocks, arms, or legs, particularly the thighs and calves. Other symptoms include tingling sensations, weakness, impaired reflexes, and paralysis. Symptoms often occur on only one side of the body. When the spinal nerves are not affected, the herniated disc may not cause pain or any other symptoms. Your symptoms intensify to the point where you have difficulty performing daily activities. You start losing sensation in parts of the body, particularly the buttocks, back of legs, and inner thighs. In some cases, surgery is necessary to treat the herniated disc, but most often other methods are used just as successfully. If you are among the majority who doesn’t require surgical intervention, the best solution for herniated discs will include non-invasive pain treatment methods. Epidural steroid injections (ESI) are a minimally invasive option for relieving pain caused by spinal disc herniation. When the disc herniation reaches your nerve roots, they become inflamed and the pain intensifies. Epidural steroid injections can reduce the pain while improving the disc herniation and enabling you to continue with your daily activities. If your back pain is caused by an inflamed facet joint, facet joint injections are one of your best options. This treatment method offers both short term and long term benefits – your pain is relieved immediately, while the anti-inflammatory mixture continues to take effect. Lumbar radiofrequency ablation is a steroid-free, minimally invasive treatment method. Just like facet joint injections, it treats pain caused by facet joints but it provides longer-term pain relief, lasting from 6 to 8 months on average. The procedure uses electromagnetic waves to target the affected nerves and remove the painful structure. Spinal cord stimulation is another non-invasive method you can consider for pain relief. The procedure uses low-level electrical signals, delivers them to the spine, and prevents pain signals from reaching your brain. A doctor may recommend a nonsteroidal anti-inflammatory drug (NSAID) to alleviate pain and reduce inflammation. This is a viable short term solution for reducing symptoms but not recommended for prolonged use. The same applies to epidural steroid injections, SI joint injections, lumbar facet injections, and narcotics which are used in cases where the pain is more severe. Other types of medicine that can be used include analgesics, anticonvulsants, and muscle relaxants which effectively relieve pain and muscle spasms but do not reduce inflammation like NSAIDs and epidural steroid injections. Physical therapy can be used if the pain does not subside in a few weeks. A physical therapist instructs you on exercises for keeping your back muscles flexible while strengthening them. Cold packs can alleviate pain and reduce inflammation while heat packs or hot compresses can be used for pain caused by muscle spasms. Place them on the lower back throughout the day or take a warm bath. You can alternate between using cold and heat and see for yourself which one suits you the best. You should only rest in the first couple of days in order for the swelling to subside. In this period you should also avoid exercise or any other form of physical strain. After this period you should keep doing light physical activity to prevent your joints from stiffening and muscles from weakening. Spinal manipulation is commonly used to treat lower back pain. A chiropractor manipulates the affected vertebrae in order to improve function, range of motion, and reduce nerve impairment. Acupuncture is an ancient Chinese practice which uses tiny needles placed on specific points of the body to treat chronic pain and has been also used as an alternative treatment option for pain caused by disc herniation. Meditation continues to rise in popularity as a complementary treatment option given the increasing amount of research confirming its psychological, physiological, and therapeutic benefits. Yoga combines meditation with physical activity and may help in relieving disc herniation symptoms as well. Surgery is not the best solution for a herniated disc except in rare cases where symptoms do not diminish after 4 to 6 weeks or where nerve loss is possible without early surgical intervention. When surgery is necessary, your surgeon may perform a discectomy, removing only the swollen part of the disc or in rare cases the entire disc. Spinal fusion might be performed to connect the vertebrae that were separated by the removed disc. This is done in order to provide spinal stability and prevent further pain. In rare cases an artificial disc is placed between the vertebrae instead. What kind of doctors to look for? 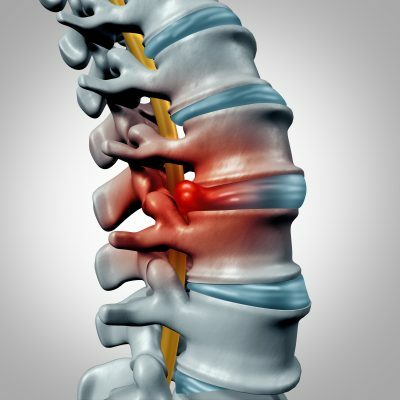 Surgical treatment of herniated discs is performed by neurosurgeons and orthopedic surgeons. Nonsurgical treatment, on the other hand, can be provided by many different kinds of medical specialists, including pain medicine specialists, neurologists, neurosurgeons, orthopedic surgeons, physical therapists, and rheumatologists. Our pain treatment clinic prides itself on the high quality of our physicians and our facilities. In case you are interested in pain doctors in New York or New Jersey, we have several Harvard-trained pain doctors who offer non-surgical alternatives as well as treatment for pain occurring during the recovery period after surgery. Our team is constantly striving to deliver the best care that advances in pain treatment allow us to give. Our physicians are a part of VIP medical group – a team of Ivy League trained, Board Certified experts in pain management treatments and vein treatments. You can request an appointment with one of our pain doctors in NY or NJ and visit us at one of our pain treatment clinics to get a high quality, minimally invasive step-by-step treatment plan.